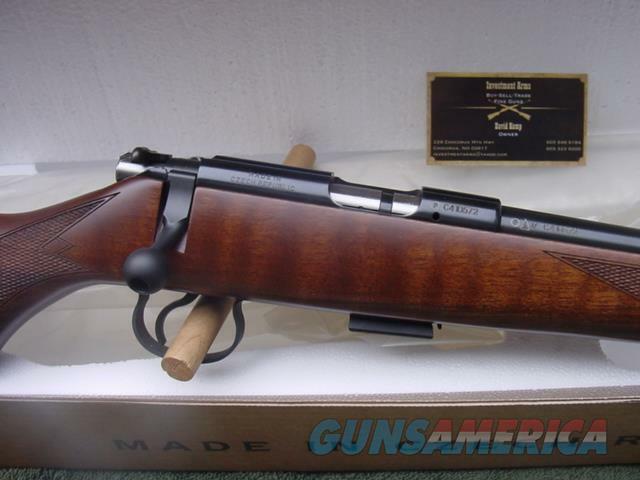 Description: CZ 455 American, this one in 22,also available in 22 WMR and 17 . Brand New in the factory box with manual and test target.These are super nice well made guns that can have the barrel swapped to other calibers. Uses 11 mm dovetail.has 5 round mag. Offered at $425, free store pickup-if shipping required figure $30-35 extra. please check to be sure gun is there as inventory changes. Happy to send along more pics,answer questions over phone or email.Please email your phone number so I can call back if I miss the call-do not have text sorry,thanks. Be sure to look at my other offerings for more guns,Mannlicher Schoenauer's, Drillings, Combo's,Colt Saa's,Colts, Rugers, Brownings,Kimber,Les Baer,Uberti'sby both Taylor and Cimarron,and Ferlib,Merkel,G&H,Parker Repro shotguns and other fine guns.Inventory always changing be sure to check with us for any needs. Payment by bank check,UPS money order-personal check held until clear 10 days.Buyer must provide dealers signed 01 FFL-email or hard copy,I will include a copy of my FFL with shipment. 3 Day non firing inspection period (gun must be in same condition if returned) on used guns only-not new guns sorry-they are under factory warranty,buyer pays shipping and insurance both ways if returned. We ,the business premise, are located in New Hampshire Country Store ,RT 16 Chocorua,NH 03817.We are there most weekends or by appointment.